President Rodrigo Duterte's satisfaction rating returns to its high level recorded in June 2017, buoyed by the approval of Mindanaoans. 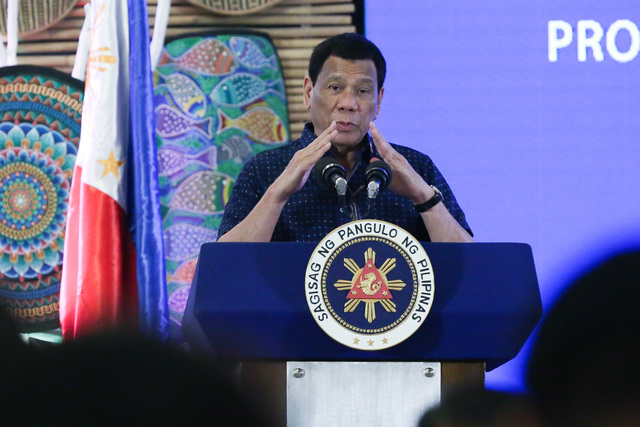 MANILA, Philippines – President Rodrigo Duterte's satisfaction rating rose in March, buoyed by Mindanaoans, about a month after the formation of a new Bangsamoro government. The Social Weather Stations (SWS) reported that 79% of Filipinos are satisfied with Duterte's performance – a 5-point rise from his 74% rating in December 2018. This gave Duterte a net satisfaction rating of +66 in March, which SWS categorizes as "very good." Thus, Duterte is back to his personal high satisfaction rating achieved in June 2017. This First Quarter of 2019 survey was conducted from March 28 to 31 and involved 1,440 adults nationwide. SWS reported error margins of ±2.6% for national percentages, and ±5% each for Balance Luzon, Metro Manila, Visayas, and Mindanao. The poll also found dissatisfaction with Duterte falling by 2 points (15% in December to 13%) and the percentage of undecided also falling by 3 points (11% to 8%). Satisfaction with the Chief Executive was pulled up by his home region of Mindanao. In his bailiwick, his satisfaction rose by 15 points. This led him to achieve a record-high net satisfaction rating of +88 (excellent). There was also a significant 7-point increase in his gross satisfaction rating in Visayas, giving him a +69 or "very good" net rating. His gross satisfaction rating also improved in Metro Manila and Balance Luzon, rising by 3 and 4 points, respectively. These numbers gave him a net rating of +56 in Balance Luzon (higher than the December rating by 4 points) and a net rating of +61 in Metro Manila (up by 3 points). Both are categorized as "very good." In between the December and March surveys, the historic Bangsamoro Organic Law was ratified and the Bangsamoro Transition Authority formed. The creation of a genuinely autonomous Bangsamoro region was among Duterte's major promises to Mindanaoans. Both the wealthier and low-income Filipinos were happier with Duterte's performance in March. Among the richest Filipinos, class ABC, Duterte scored his highest net satisfaction rating among that class: +69 (very good). This is 7 points higher than his +62 rating in December. A similar story can be seen among the "masa" or class D. Duterte also achieved a record-high +68 (very good) among them. This is a 10-point rise from his December numbers. The same cannot be said for the poorest Filipinos. Class E respondents may have given him a +58 rating or "very good," but this is lower than his December rating by 7 points.